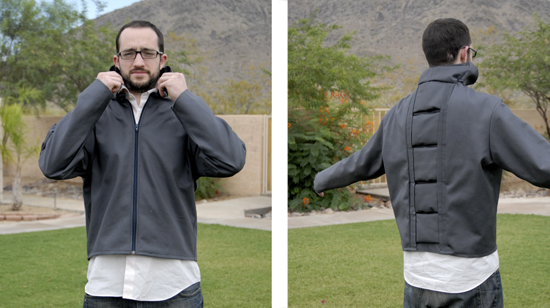 Jacket Prototype #1–not bad, eh? Chris has been obsessing over the Kitanica Jacket, mark IV worn by Adam Savage from Mythbusters. 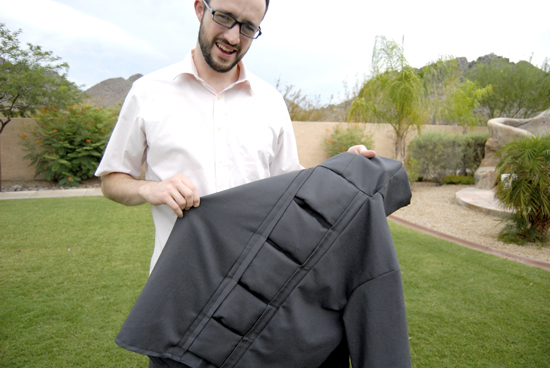 $600 for a practically handmade jacket is not SO bad, but considering money isn’t something that grows on any kind of plant in Arizona or Utah, it’s not likely that Chris will see a real Kitanica jacket in his near future. NO, no, no! NO way, Jose. I am washing my hands of this project. Instead of standing up to the mammoth challenge of sewing a men’s outdoor jacket, I taught Chris how to thread the sewing machine and answered -very unenthusiastically- all million questions he had about fabric, zippers, patterns, etc. Considering my lack of support and his skill level, I think he did a fabulous job! It actually looks like a jacket and the seams are surprisingly straight. He’s figured out a lot in the process, so I’m excited to see how the actual jacket turns out and if maybe he’ll sew a thing or two for me in the future! dang, you guys are my heroes! good job chris! i’m impressed. Where was my domestic son when all those boy scout patches needed to be sewn onto your uniform? Furthermore, why didn’t you learn to use the sewing machine when I had to hem your pants for Phoenix Boys Choir? I guess it’s better late than never. The dry run on the jacket is most impressive. Sweet. Teach a man to fish. That is awesome! Props to your husband! Perhaps he can inspire mine to do something. ANYTHING…. Hat’s off to you dude, nice work. I was just searching the Internet trying to find out what the patch is on Adam’s Mark IV cuz I just bought a real one and wanted the same patch. I came across this blog and thought I coulda just had you make me one! Could have saved me a bundle!